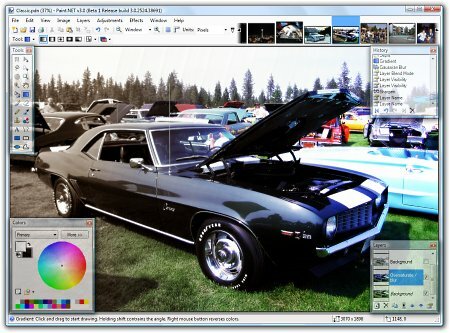 Paint.NET (version 3.05, Windows only, released March 29th 2007) is shaping up to be a great photo editing application. Version 3 is available in eight languages and has a slew of great features including: layers, tabbed interface, shape drawing tools, gradient tools, magic wand, clone stamp, blurring, sharpening, effects, brightness, contrast, curves, levels, and a lot more. The Paint.NET guys modestly call this a replacement for MS Paint. This baby blew MS Paint out of the water about two major versions ago. One of the best features is that it is free and open source and being actively worked on by a dedicated team. If you’re in the market for a photo editing application you could do a lot worse than try Paint.NET.